Our stock all ships from our US-based warehouses. Shipped via USPS or UPS (depending on location and package weight) Unless stated otherwise, all orders will ship within 24-48 hours of your payment being processed. 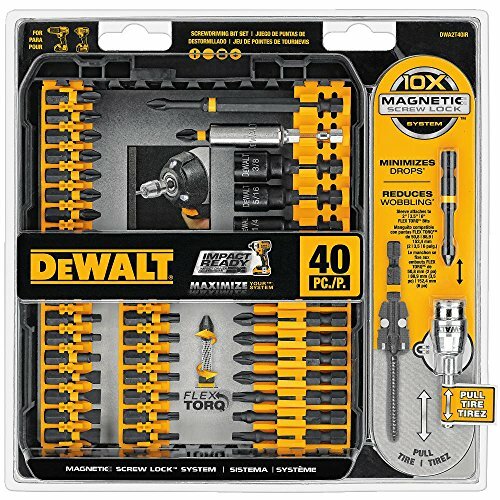 DEWALT DWA2T40IR IMPACT READY FlexTorq Screw Driving Set, 40-Piece Make sure this fits by entering your model number.Minimizes DropsReduces Wobbles Breakage10x Magnetic Screw LockFlexTorq allows bits to flex up to 15 degrees10x Magnetic Screw Lock systemMinimizes drops and reduces wobblingReduces breakage and longer life DEWALT DWA2T40IR IMPACT READY FlexTorq Screw Driving Set, 40-Piece This 40-piece screwdriver set has plenty of screw tips for all of your driving needs. Specifically designed for impact driving, these tips reduce breakage. They minimize drops and reduce wobbles for more time working and less spent picking up fallen screws.